Get certified to use the TORMACH Personal CNC for metal machining. This workshop is for anyone that has completed the Shopbot class and wants to machine small metal parts. We will cover basic machine operation and safety. The system accepts files for both 2D and 3D models. Additionally, basic machining functions are included within the PathPilot R Interface software. These functions use a Conversational screen to generate the G-Code, which then runs the machine. 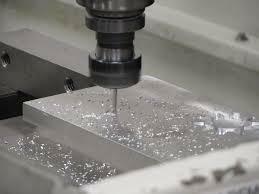 Typical functions include Face, Profile, Pocket, Drill/Tap, Thread Mill, and Engrave. The machine is capable of milling materials such as circuit boards, aluminum, steel, and iron. The table travel capacity is X-18”, Y-9.5”, Z-16.25”. Our machine is the TORMACH Personal CNC, Model PCNC 1100. It uses a spray coolant system to maintain temperature and remove material.